Lords of the Peaks is the first of Paradigm Concepts' Races of Legend sourcebooks. Designed as a Game Master's toolkit, Lords of the Peaks delves deeply into the culture and myth of seven different Giant types. Challenge your players with new twists to old opponents or pit them against new and terrible foes. 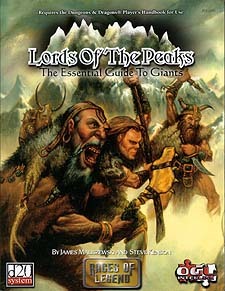 Go far beyond the basic details of existing monster entries with: Lords of the Peaks! * So many Feats and Skills that it would take a giant to shake a stick at them. * Several new prestige classes including the Reaver of Wyrms, the Terramancer and the Giant-Slayer. * New Clerical Domains and Spells. * New magical items to augment your Giant NPCs. * Rules for creating your own new and unique Giants. * And, introducing a new "Epic" opponent for your very High-level campaign - The Celestial Giants. Lords of the Peaks requires the Dungeons & Dragons Player's Handbook, Third Edition.